Johnny (Russell Streiner): They’re coming to get you, Barbara. It’s Halloween. Laurie Strode and Annie Brackett are driving together to their respective babysitting gigs in houses located across the street from one another—a logistic that is not only convenient in terms of two friends carpooling but also in offering the perfect setup for a director hellbent on terrorizing. Pulling back the curtains in a living room where Jamie Lee Curtis is precariously stationed, John Carpenter is able to neatly frame a masked maniac wandering to and fro outside a Midwestern suburban home in everywhere, USA. The creepy, too-close-for-comfort point of view places the audience smack dab in the center of mayhem. With popcorn bowls in hand (like the teenagers on-screen), we glance away a little spooked at what might be lurking outside our own curtains if we were to take a peek right now. They’re coming to get you, Mr. Carpenter. It is this same across-the-street view to a kill that the film It Follows employs to scare its audience with in kind. And it is only one of many shout-outs to the Carpenter classic, each as delicious as a candy bar pulled from a plastic pumpkinhead. Indeed, from the opening scene that narrows its focus to a suburban home and surrounding neighborhood, It Follows stalks the John Carpenter classic with such unabashed glee that you wonder if even its title is in on the fun. Midwestern fall foliage feels like it may have blown in from Haddonfield, Illinois. And as it was in Halloween, the background and foreground vie for attention, combining to keep viewers on edge as active—if not increasingly paranoid—participants. Recall Michael Myers following Annie and Laurie’s car in Halloween as the Blue Oyster Cult’s “Don’t Fear the Reaper” plays on the radio. Both films affect a polarizing, multi-dimensional state of suffocating yet exhilarating suspense. 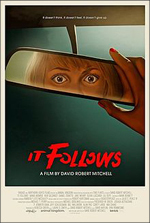 It just so happens that It Follows is also a scream queen flick that features teenagers being stalked by a killer who perhaps not coincidentally possesses the methodically menacing gait of Michael Myers or the zombies in Night of the Living Dead. There are the schoolroom scenes where our heroines are distracted from what is happening in their respective classes by a mysterious and frightening figure lurking outside. There is the shared teenage coming-of-age angle and It Follows doesn’t seem to disagree that there should be a P.J. Soles-price to be paid for promiscuity. There are old sci-fi horror flicks on televisions with their volumes turned up just enough to catch frightening phrases from the movies inside a movie. There are plentiful use of daylight scares in both films, unlike many horror movies where daytime is typically synonymous with safety and nighttime is reserved for the witching hours. Even the score plays déjà vu with your senses, sounding like a Carpenter creation. At a time when good horror films seem fewer and farther between, It Follows is a welcome throwback. Maybe it’s true that you can’t ever really kill the bogeyman. In this instance, that’s a good thing.